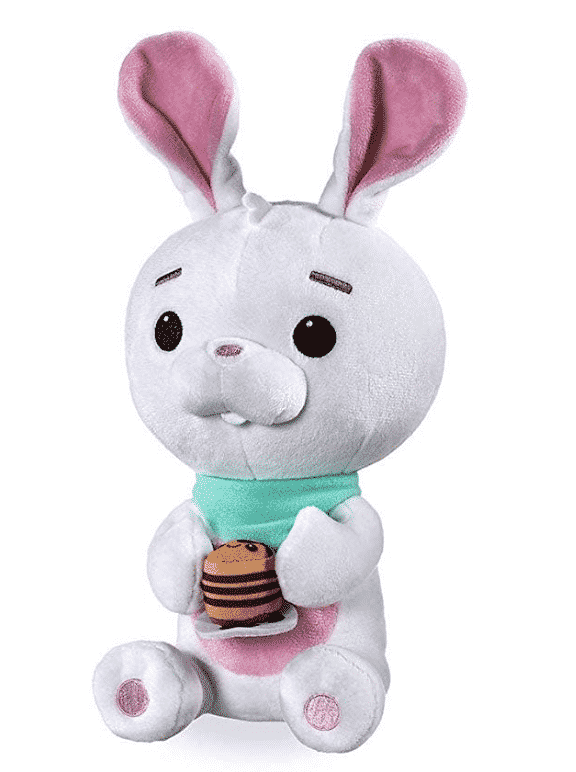 You might have noticed that there is a lot of Ralph Breaks the Internet coverage on the blog lately and with good reason! The red carpet premiere in LA was amazing and now the movie is about to release on the 21st. It’s just such a fun time to be online! We all know that Vanellope and Ralph go on an Internet adventure in order to try to save Sugar Rush. 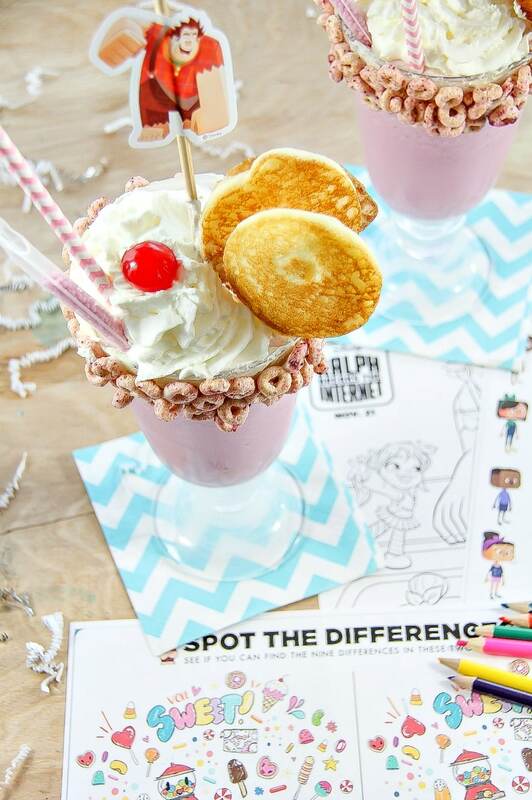 What better way to cheer them along than with this super fun Ralph Breaks The Internet Morning Milkshake Recipe. Surprise your kids or have them help with the creation. 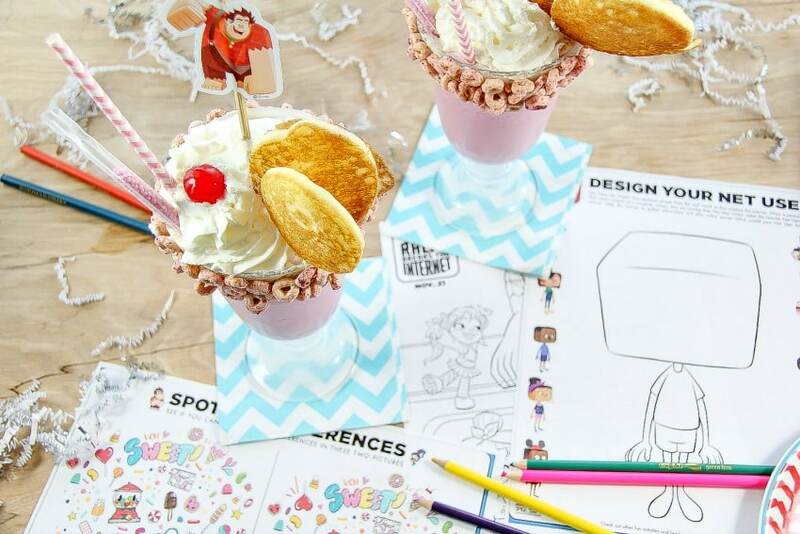 Looking for all of those super cool Ralph Breaks the Internet coloring pages and activity sheets? No problem! Click here! As many as you’d like to download – all waiting for you. Ok, seriously. 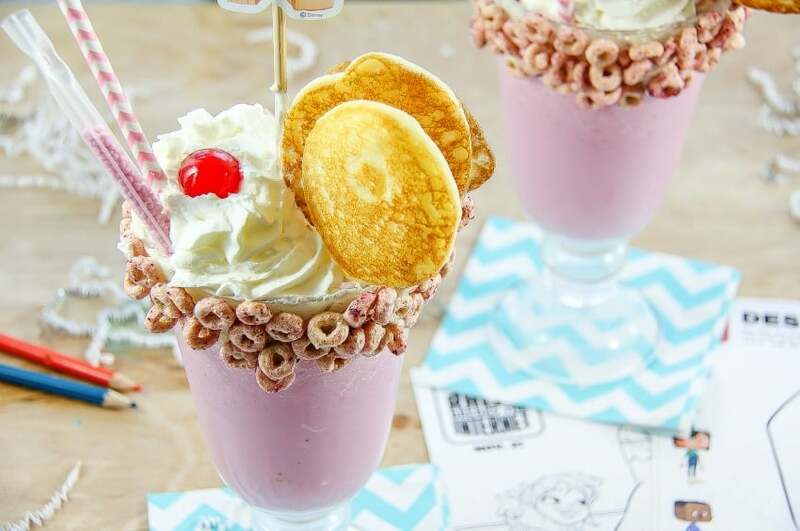 Maybe you aren’t entirely sure WHY the morning milkshake has pancakes in it… but it’s with good reason. Here’s a hint. Make sure you stick around and watch the entire film to find out why. SUPER CUTE! 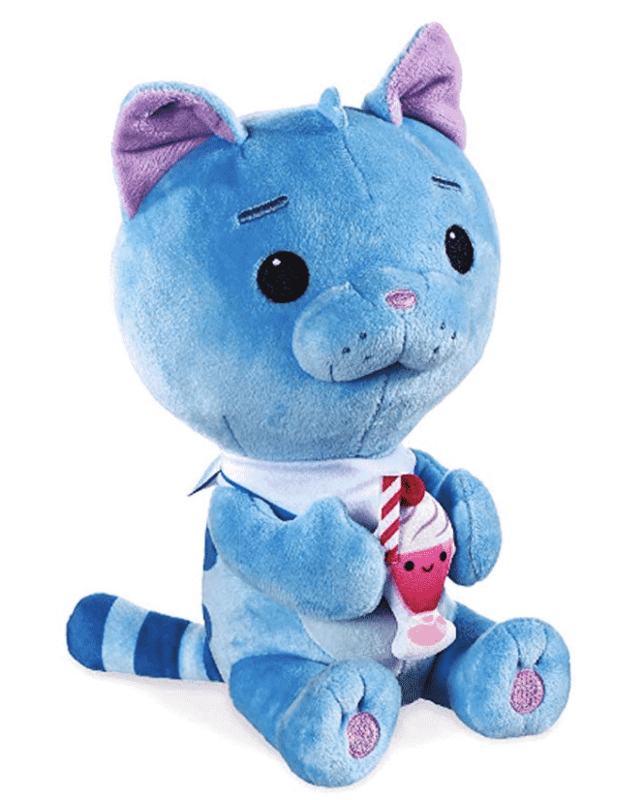 And yes, you need these two plush dolls because they are so ADORABLE OMGICANTSTANDIT. I made these breakfast shakes gluten-free. All you need to do is make sure to use your favorite gluten-free pancake mix and cereal. Make your pancakes how you normally would (I used a bloxed gluten-free mix), adding just small dollops of batter to your pan. Once the first side is almost cooked, place your stick across the center, covering it with batter before flipping the pancake over. Blend your frozen strawberries and milk in the blender until thick and smooth. If you need to make it a little sweeter, add a teaspoon of sugar or honey, then blend again. Melt the white chocolate in the microwave for 10 second intervals, stirring after each. Once smooth spread it around the rim of your glass and attach the berry-flavored cereal. 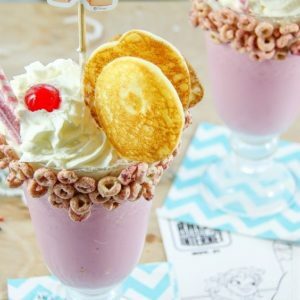 Put a little ice into your glass, top with your breakfast shake, then top with whipped cream, a cherry, pancakes, and straws. 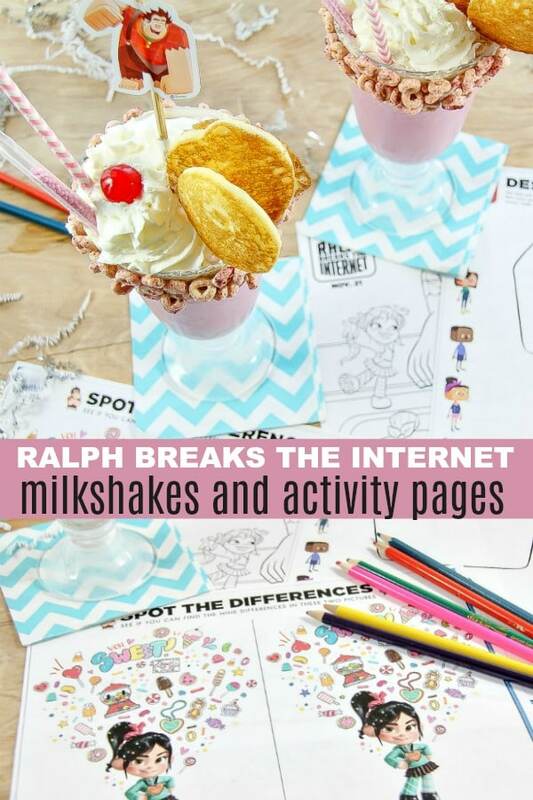 Don’t forget to print out the fun Ralph Breaks The Internet activity pages we provided last week. The kids will love this fun morning you have planned for them before seeing the movie.